How long does Willie Taggart get to turn around the program at FSU? If he fails do you foresee any scenario where he could return to coach at USF? Larry, as you know, there are already outraged fans. It never takes long when a once-proud program goes into the ditch. Fans have zero patience. There are fans who would fire Taggart today and refuse to sell him gas unless it was going to be used to get him out of town. But to fire Taggart now would be costlier than the university can afford. It would also be reckless and irrational. 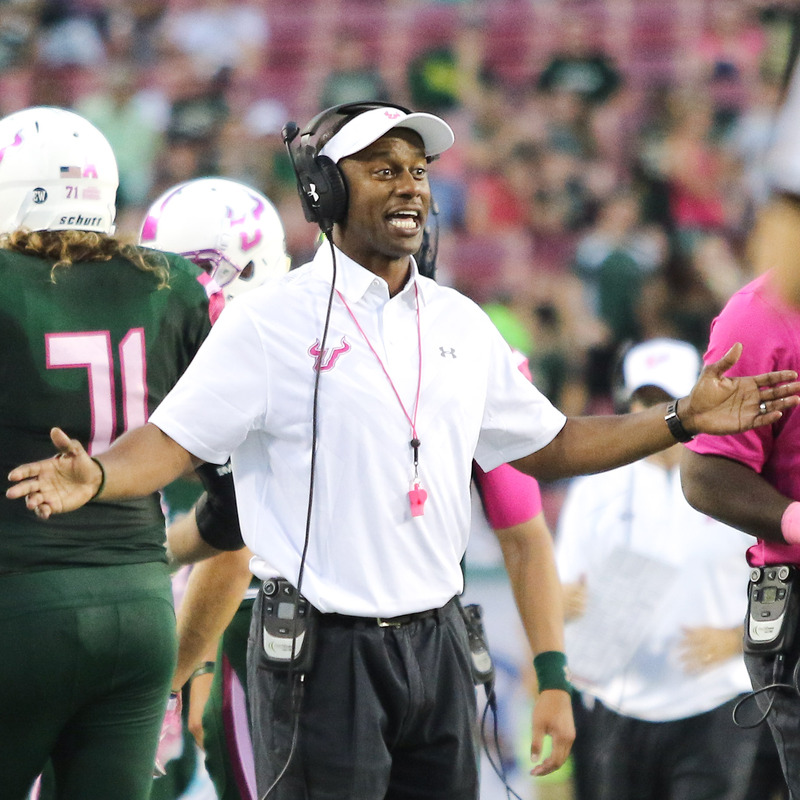 No, Taggart didn't have a good first season; he didn't have one at USF, either. But if you're going to pay him $25 million to go away, and then you're going to hire someone else for about the same coin, well, that's a lot of student fees at work, isn't it? I think Taggart gets three seasons. He should probably get four, but no one is patient anymore, are they? I think Taggart will have to show some improvement next season, and he better be able to win in 2020. Or the grumbling is going to get serious. It isn't just the winning. A lot of people -- including former players -- are ticked at the apathy the Seminoles showed on the field, as if winning wasn't that important to them. A player gets a lot from his coach, but his passion for the game should always be there. Frankly, there were very few moments all season when FSU didn't look like a losing team. It's as if the players read their recruiting grades and thought that meant they didn't have to try very hard. By the end of Taggart's first three seasons, we should be able to tell a lot about this program. Either it is an elite program, or it's time to start over. College football is a younger man's game now more than it has been for years. Someone pulling for Taggart should hope for seven wins next year and nine the next. That won't satisfy the spoiled fans, but it should convince the masses that the program is on the right track. If FSU can't do that, the voices will rise, and Taggart himself might be ready to move on. But Taggart liked it here, and he was successful. If Charlie Strong were to go to another school just as Taggart was coming available, I could see it happening. But I don't think USF fires anyone to bring Willie home. If Taggart is successful at FSU, he can go anywhere he wants (if he wants). If he isn't successful, however, he might find comfort in USF again. Again, it's highly unlikely that the timing works out. The Bucs/49ers game this past Sunday had paid attendance of about 50,000 and actual attendance of about 40,000 - 10,000 no-shows. That means 10,000 season ticket holders did not attend the game. So why would the Glazers offer two free tickets to season ticket holders for this Sunday’s Panthers’ game? I actually think it's a pretty good move, Scott. But I could be wrong. This way, you reward your season-ticket base. You tell them "hey, we're sorry this year hasn't been better. Bring a friend to the game." And so you get more fannies in more seats, and more people buying beer and hotdogs. You hope that a percentage of those folks think "Hey, this is a pretty good place to see a football game" and hope that they then buy tickets. What's the downside, really? That those who bought ticket resent those who didn't? Maybe. But stadiums are meant to be full. There should be noise and passion and excitement. Of course, we don't know that the Bucs will allow any of that from their fans. Think of it as a bogo for the season ticket holders. You buy your ticket, and now you can take a client or a neighbor or an in-law to the game. Isn't that better than having the stadium half-empty? I was listening to sports radio yesterday and they were talking about how Tampa Bay is now a hockey town....not football. Do you agree? Why can't a town be both? Why can't you like the strategies involved in football and the free-flowing nature of hockey? You know I love hockey. But, no, I don't think it's overtaken football in central Florida. Football has too much of an advantage. There are a thousand kids in the youth leagues, and a thousand families arguing about the game over dinner. I think on non-game days, the Bucs are still bigger. The Lightning are certainly more successful these days, and they're better run. But to overtake football for the casual fan will take some doing. Put it this way: What brings about more conversation -- a late-season hockey game or the NFL draft? The draft, of course. Remember this: A sellout hockey crowd would be an embarrassing football crowd. We love hockey, and we pull for hockey. But football is in our DNA. I covered the championship seasons of both teams. And I think the grind to win a Stanley Cup far exceeds the march to a Super Bowl. But I remember this, too. When the Bucs went to the Super Bowl, no one in town wrote a word that wasn't devoured. I will say this, though. Hockey is far more popular than I ever thought it could be in Florida. More people love the games. More people know the players by name. I know this. The thing I've always loved about sports is that when football is over, it's hockey season, and when hockey is over, it's baseball season, and when baseball is over, it's football season. The cycles complement each other. No, we aren't primarily a hockey town, not to the exclusion of football. But we're not just a football town, either. There is room in our interest for both sports, and for baseball as well. Where do you stand on the idea to expand the college football playoffs? Seems to me that, no matter how many teams become part of the playoff, there will always be controversy as to who doesn't make it. Of course, the NCAA and various media thrive on controversy. Maybe it will all come down to whether expansion can be accommodated by television? Barry, you're absolutely right. If 64 teams made it, the 65th would be whining that it was left out. I'm like most of us. I like football, and I hate when excellent teams are left out of the mix. I would certainly watch an eight-team playoff. But do we need it? I don't think we do. I think the conference championship weekend takes care of that. Really, when is the last time that eight teams deserved to win a national title? Most years, you could argue for a fifth team. Maybe a sixth. But I can't remember a year when you thought the eighth-best team in America could beat the No. 1 seed. Every week, I run an item called "if there was an eight-team playoff" in the college football roundup. This week, I was left with Utah and Washington playing for one of the slots. I don't think anyone thinks either of those is deserving of the trophy, but that's where we would be. Bill Hancock, the executive director of the playoffs, is a friend of mine. And when this started, he talked about how they would be at four teams for awhile. They wanted to preserve the regular season, and eight teams would take away from it. Remember the days when only two teams got into that mess called the BCS? That was absurd. There was always a third or a fourth team that had a legit shot. Maybe it's because what we have now is so much better than what we had then that the four-team format doesn't bother me as much as it does some people. To sum it up, sure, I'd prefer eight. But I can live with four just fine. Watched Dallas-New Orleans, it looked like a playoff game. This year I like New Orleans from the NFC, and Kansas City from the AFC. Which teams are your favorites to make a run this year? I like your two picks. I hope the Saints (I love Drew Brees, even if I think Sean Payton is a tool) and Chiefs go a long way. I also like the Rams. They're a nice example of adding stars and getting them to play together. New England is always a contender, of course, and you like to have their name-brand in the tournament. I'm intrigued by Pittsburgh, and I want to see how Houston can do in the post-season. If I had to pick now, I'd pick New Orleans over the Rams for the NFC title game and the Patriots over the Chiefs for the AFC title. I'd pick New Orleans to beat the Patriots for the Super Bowl. But it's still November. I have a right to change my mind. Previous post: Bolts beat Buffalo on a shot by … Paquette?